Moldova is a Republic of 3.5 million people that borders Ukraine and Romania. After centuries of serving as a vassal to the Ottoman Empire, Russian Empire and the Soviet Union, Moldova gained its independence in 1991. The transition to independence has not been easy. Economic instability and political turmoil have made life in the young republic rife with uncertain. Kishinev is the capital and largest city of the Republic of Moldova. It is an industrial and commercial center of some 700,000 people. For centuries, the city was known as a refuge for the Jews. The crushing poverty and rabid anti-Semitism that the Jews faced in Russia drove many to seek a better life in Kishinev, and by the turn of the century, the city was one of the thriving Jewish centers of Europe, full with yeshivot and synagogues. But Kishinev soon became famous for more tragic reasons. On Easter day, 1903, a massive pogrom in tore the Jewish community apart and shocked the world. The terror was repeated again in 1905, when political demonstrations turned into another pogrom. During World War II, Kishinev was the epicenter of combat in Eastern Europe. By the end of the war, only a few thousand of Kishinev’s 65,000 Jews survived. After the war, all religious practice was effectively prohibited by the Soviets. Those who held on to any Jewish practice, or even spoke the Yiddish language, did so at the risk of their lives. For decades, it appeared as though the embers of this historic Jewish community had finally burned out. Once free from the grip of communism decades later, Moldova and other former Soviet republics found themselves in a state of economic and social chaos. Those Jews who could, mostly the young and more prosperous, emigrated to Israel or the US. Today, there are some 10,000 Jews who remain in Moldova, with most of them in Kishinev. Those who were left behind, the elderly and poor, find themselves just out of reach of a better life. Friends of Kishinev Jewry was founded in 1995 to care for the needs of this historic and resilient community. Under the Directorship of Chief Rabbi Zalman Abelsky, the organization has provided for the essential needs of the community and restored a sense of pride and hope for the Jews of Kishinev. 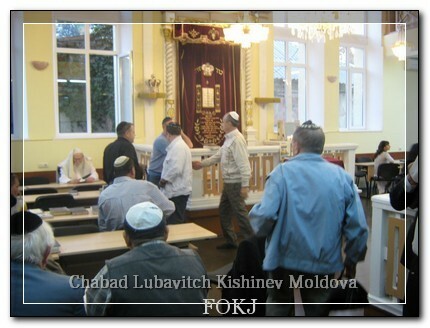 Today, there are some 10,000 Jews who remain in Moldova, most of them in Kishinev. Those who were left behind, find themselves just out of reach of a better life.